I owe most of what I know about the art and craft of writing to one journalist, a man called Hume Dow, who was older than my parents, and who had worked on the Age, which I think was back then still the Argus, with George Johnston and Charmian Clift during WW2. Whenever he talked about the gorgeous and brilliant Clift, he was unable to finish any given sentence. He would just waver off in mid-syntactical construction and gaze off into the middle distance. Hume taught me how to proofread properly and what good 18th century prose looked like and why Hemingway in A Movable Feast, but not in his fiction so much, was a miracle of writing. Another of my major mentors, whom I knew intimately and won't name (grounds, incriminate, etc) was also an exceptional journalist before he moved on to other pursuits. I have great respect for a number of contemporary Australian journalists (Megalogenis, Tingle, Marr, Grattan, Colvin et al), not to mention the legendary international ones, and I have just finished reading a novel about two heroic journalist-photographers, Gerda Taro and Robert Capa, who both died in the service of their vocation. And I think all these things may be why I hold the bad ones in such contempt. 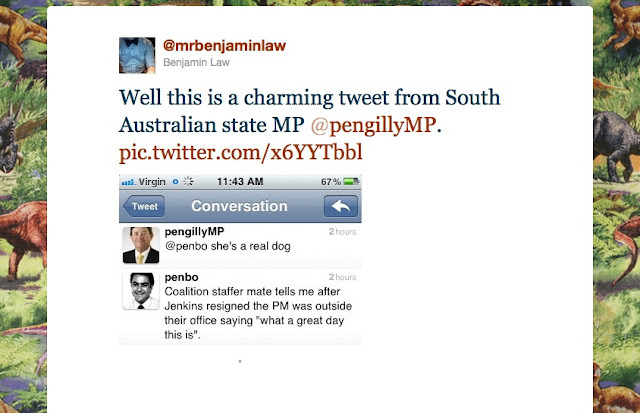 In which the very savvy Mr Benjamin Law takes a screen shot of SA Liberal MP Michael Pengilly's Tweet this morning in response to one from journalist David Penberthy (Twitter is a bottom-up read) on the subject of the Government's response to the resignation of Harry Jenkins as Speaker. Because, of course, any minute now someone's going to let Pengilly know that he wasn't having a private conversation, and that his opinion of the Prime Minister is there for all the world to see, and then he's gonna take it down. Much too late. Hah. UPDATE, 2.07 PM: Yep, he's taken it down. Hee Hee. I heard the most wonderful interview with Paul Kelly on the car radio yesterday and wrote a long post about music in my head but of course it's all gone now. Well, nearly all; hands up anyone else who remembers Peter, Paul and Mary singing 'I'm in Love With a Big Blue Frog'. Sigh. This kind of stuff -- students buying pre-written essays to memorise and then regurgitate (and I use the verb advisedly) in their HSC exams -- has made me reflect on the olden days of last century, when I wor a lass, and my cohort had to sit a total of five, count 'em, five lots of public exams within three years. In Intermediate (the year we all turned fifteen, the equivalent of Year Ten) we sat the exams for Commonwealth Scholarships for the last two years of school -- these were essentially IQ and general-knowledge tests, not things you could prepare for in any way apart from staying healthy and getting enough sleep -- and only a few months later we sat three-hour exams in each of eight subjects. The following year, Leaving (Year 11), we sat another set of three-hour exams in six subjects. And the year after that, we sat for another round of Commonwealth Scholarships, this time to university, plus more three-hour exams in five Matric (Year 12 / HSC) subjects, except for the exceptionally clever kids who did six because they could. That's 60 hours of competitive public examinations over three years, in an era when there was no continuous assessment: your result for the year depended entirely on how you scored in the exams. And if you didn't pass a sufficient number of them, then that was it: you repeated the year or you left school. Nobody cheated, perhaps partly because they were not the sorts of exams for which cheating of this kind would have been possible. Then, of course, there were the university exams, by which time you could score at least part of your result through essays handed in during the year. Not much, though. And if in later years as an academic I ever got sick of my Honours students complaining about how hard they had to work, all I had to do to make them stop was tell them about the assessment for my own Honours year: two 12,000 word theses, plus four three-hour exams in a total of six different subjects, two of them (Practical Criticism and Shakespeare) compulsory. Like many of my mates in that year, I was by then living away from home and worked all the way through the exams, in my case washing dishes in a Greek restaurant. I was, however, alone in the charming experience of going to court about my no-contest divorce about halfway through the exams. What's more, I walked five miles to school and university barefoot in the snow. And I think you should all get off my lawn. Never having heard of this delightful young woman, though I sure as hell have now, I was mesmerised by this song on the car radio this afternoon, on Adelaide's local ABC. I used to listen to, and perform, a lot of folk music when I was in my teens and twenties. But I didn't have the analytical skills I have since acquired, in 35 years of reading and thinking about literature and society, to think about these kinds of songs in a way that any educated young woman would automatically think about them now. If someone held a gun to my head and said 'Write a 3,000 word feminist analysis of this song and its narrative structure in the next three hours or you will be shot,' there is no doubt that I would get out of it alive. But never mind that for the moment -- and you will get the gist at a visceral level anyway. Just have a listen to Sarah Calderwood's filigree musicianship and this haunting tale of commerce and nemesis, impossible to tell convincingly in any but a minor key.